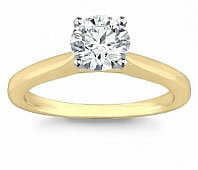 A diamond solitaire ring has traditionally been the preferred ring of couples planning to marry. A diamond solitaire engagement ring has thus come to symbolize a man’s undying love and steadfast commitment to his life-partner. It also sends out a signal to other eligible bachelors that the lady is engaged and no longer available for dating. What are Diamond Solitaire Rings? - the answer is simple. The word ‘solitaire’ is derived from the word ‘solo’ whinch means these are rings with a single diamond that stands alone without other precious side stones. For many, soiltaire rings are presented during engagement presumably to convey that the man has single-pointed love for his partner. People who may not be able to afford real diamonds use other stones instead of the diamond such as rubies and sapphires. 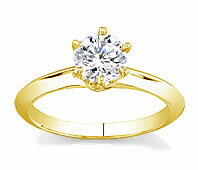 But almost everyone would like to purchase a diamond solitaire ring as it is something that will last a lifetime. Novori Jewelry makes this truly affordable to all. The traditional setting of the diamond solitaire ring is either white gold or 18k gold – though the trend is changing and more and more couples now prefer metals like platinum that are somwhat more durable. These stronger metals help designers to be even more bold and creative which is why you can find a plethora of different styles of diamond solitaire rings in the market. Platinum diamond solitaire rings are no doubt more expensive but they are sturdy and last much longer than silver and the platinum also retains its shine and does not become dull with age. 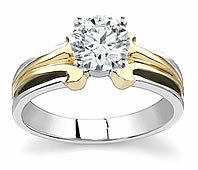 Opting for a two-tone ring or using a superior quality metal than the standard 14 karat gold like platinum will doubtless enhance the beauty of the diamond solitaire rings. 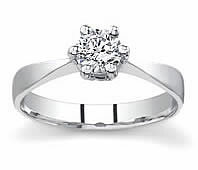 Novori Jewelry can assist you with finding the perfect diamond and ring in the right metal. Just give us a call toll free at 1-877-877-4141. If you want to impress, then you can buy engagement rings that have a single diamond larger than an average size diamond or select a style with side diamonds. But it is not always necessary to choose rings with a large single diamond in order to show elegance and beauty. You should try to highlight the characteristics of the ring and the purity and sparkle of the diamond rather than its mere size. In fact, a relatively smaller diamond set in a thinner band will make the diamond look more prominent and will better suite a hand with slender feminine fingers. More than being carried away by the size of the diamond, you should concentrate on the various shapes of the diamond as it is the shape that lends the extra charm. There are many diamond shapes other than the standard round shape. Marquise, pear and oval generally make the diamond look much larger and more prominent. In fact, a single heart-shaped diamond will look unique and grab the attention of all your friends. As diamond solitaire engagement rings carry a single diamond stone in majestic isolation, it should live up to its natural brilliance. 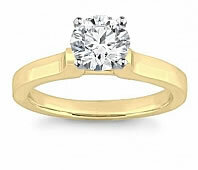 Therefore, while buying you should pay attention on the familiar four Cs - Clarity, Cut, Carat and Color. The cut of a diamond give the diamond life, sparkle and fire. Our diamond expert at Novori can provide you excellent choices for diamond selection for your ring. Please remember that when buying a diamond solitaire ring, you should request a diamond certificate. All diamonds should be GIA certified and come with a certificate to ensure the value of the diamond. Novori is a leading online retailer for diamond engagement rings and solitaire rings and can help you find the perfect setting and the perfect diamond.